One of America’s most beloved TV personalities has finally returned to stand-up. Comedy legend Ray Romano appears in his first comedy special in 23 years in “Ray Romano: Right Here, Around the Corner,” which premiered on Netflix on Feb. 5. In his time offstage, a lot has changed. Romano is 61 years old and has appeared in dozens of films and TV shows such as “Ice Age,” “The Big Stick” and “Vinyl.” He has curated an extensive filmography and cemented himself as an icon. His comedy special proved that little has changed: he is still funny. The special is divided into two halves, with Romano performing two separate sets in two separate locations in Greenwich Village in New York City. He starts in The Comedy Cellar and then literally walks “around the corner,” as the title suggests, to his second show at the Village Underground. This not only provides a title for the comedy special, but also gives the special a format that’s different than any other comedy special that’s on Netflix right now. After his performance at the Village Underground, there’s footage of Romano talking about the show and getting pizza with his family. The inclusion of this footage made the special feel almost like a mini documentary at times. It showed a side of comedy specials that’s typically not accessible to the viewer, which makes “Right Here, Around the Corner” stand out. The fact that it’s been a while since Romano has done a comedy special is made almost a central focus — it’s something that the audience is made aware of from the very beginning. This turns Romano into a character, an old and seasoned professional, who’s making an effort to start from square one and get back to his roots. The whole special has a sort of humble feeling to it. Right off the bat, the setting helps create a feeling of humility. Romano performs in the area where he kicked off his career over three decades ago. He also mentions that he’s performing at these venues unannounced, akin to the “guest spots” he used to perform at the exact same venues at the beginning of his career. Romano is a performer with a name big enough to fill large venues and headline his own event, just like the comedians of the other comedy specials that have found a home on Netflix. At the beginning of his first set, Romano states that he and the audience are “both going to be disappointed” in his comedy. This disclaimer shows that Romano realizes he may be a little rusty and is warning the audience, rather than pretending that he totally knows what he’s doing. Romano often pokes fun at his own age. Instead of viewing it as a deterrent, Romano uses this as the basis for many of his jokes. One bit was based on the idea that a person should select their friends at certain points in their lives based on what they need most. Romano mentioned that people around his age should make lots of friends who are doctors because he always seems to need one for one reason or another. Romano also tries to give the impression that his age makes him an authority on different life matters. Many of his jokes are about his experiences as a father, husband and all-around adult. He acknowledges that many members of his audience are younger than he is, and many of his jokes come across as advice for this audience. For example, he tells his listeners that when they’re married, they need to recognize their wives’ haircuts before it’s pointed out to them. Romano’s jokes are different than those of other comedians in terms of their relatability. 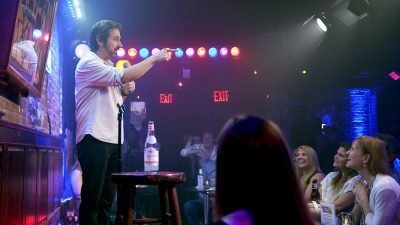 Other comedians’ jokes feel relatable to the audience at the present moment, while Romano’s jokes feel as if they will be relatable, eventually. It’s as if he’s predicting your future through his comedy. “Right Here, Around the Corner” is a fresh take on comedy, thanks to its format and Romano himself. This may have been his first special in 23 years, but it proved that he still knows what he’s doing.